This article is about the item which originated in Donkey Kong. For other uses, see Hammer (disambiguation). 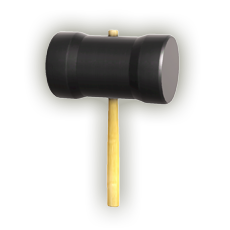 The Hammer (ハンマー, Hammer) is a close-range item that appears in all Super Smash Bros. games. Upon being grabbed by any player, it sends them into a unique state that inflicts significant damage and knockback. Mario using the hammer in Donkey Kong. The hammer comes from the arcade game Donkey Kong. In Donkey Kong, when Mario obtains the hammer, he is unable to stop swinging until the hammer disappears. He also is unable to climb ladders while swinging the hammer. The hammer can be used to destroy barrels that are being rolled down towards Mario, and can be used against other enemies. Contrary to its depiction in the Super Smash Bros. series, the Hammer's head cannot fall off in the game, nor can it otherwise malfunction. 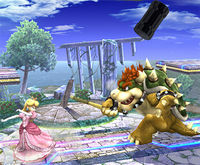 Bowser swings the Hammer in Super Smash Bros. for Wii U. Upon picking up the Hammer, characters enter a unique state; they will constantly swing the hammer back and forth, and will be unable to midair jump, use any other attacks, or defend. The Hammer also cannot be manually dropped unless the user has been sent into a state of tumbling. The Hammer deals about 22% per hit, and it also deals extremely high vertical knockback, potentially KOing opponents at low percentages; the effects of the Hammer are even more formidable in Super Smash Bros., where the Hammer instead does 30% damage with even more knockback. The Hammer can also "chain" into itself, doing 60% and likely KO the opponent. The Hammer disappears after seven seconds. The Hammer, however, limits the user's options, and particularly careful hitbox placement by other characters can potentially interrupt the wielder. Counters are especially powerful against Hammers since most of them deal more damage for any attack they counter. As the wielder of the hammer cannot use special moves or midair jump, sending an opponent off a ledge while they swing the Hammer can effectively KO them unless they can somehow drop the Hammer. In Brawl and Smash 4, the Hammer also operates on a "timer"; if a character wielding the Hammer is constantly hit so that they cannot swing the item, the timer will still count down, potentially getting rid of the Hammer before they can properly use it. The Hammer is also an item in Smash Tour: when its trophy is selected, the user starts the battle wielding a Hammer. A Headless Hammer in action. Starting in Melee, there is a 12.5% chance (one out of eight) of the head of the Hammer falling off as it is picked up, after which the item becomes functionally useless, though the wielder will continue to swing the handle for as long as they would with a normal hammer. The Hammer Head itself can be picked up and thrown as a powerful item, dealing 35% when smash thrown. If the Hammer Head falls off, then the player is rewarded with the Headless Hammer bonus, worth 2500 points. This bonus only appears in Melee. If you grab the Hammer, you'll run across the screen swinging it back and forth nonstop. In Donkey Kong, Mario used the Hammer in exactly the same fashion. It's an extremely powerful item, but you have no recovery move when carrying it. Every now and then, the mallet head will fall off, and you'll end up completely vulnerable, swinging just the handle. An item that, once grabbed, makes you swing nonstop. It's a powerful attack item that does terrific damage and sends opponents sailing. Once in a great while, the hammer's head will fall off, leaving you nothing but the handle. Of course, you can't tell whether the head is securely fastened just by looking. Hammer heads that fall off can be picked up and thrown as weapons. This is something you just can't stop swinging. At all. You'll do a lot of damage with it, but... you won't be able to jump in mid-air or use special moves, so if you fall off the stage, good luck getting back on! Oh, and if the head pops off, you'll be left waving the handle around. If that happens... man, you are going to look ridiculous. A hammer is just a stick until you add the top. That's where this item comes into play. Sometimes, however, the top comes off. If that happens, just grab this loose part and throw it at your enemies. For some poetic justice, make the guy swinging the hammer handle your first target. If the head of a hammer should happen to fall off while someone's waving it around, don't let it go to waste! It's great for launching people, so pick it up and throw it at someone! How about that wally waving the hammer handle around? He's just asking for it! Hammer artwork in Smash 64. A Hammer head in Melee. Ridley holding a hammer in Ultimate. King Dedede swings both the item and his own hammer in a back-and-forth fashion; his own hammer, however, does not actually do any damage, even if the Hammer's head falls off. Pit swings the Hammer by pivoting his wrist in right angles; furthermore, his animations become much choppier, with his jumping and walking animations referencing Pit's sprite from the original Kid Icarus. This behaviour also carried over to Dark Pit in Smash 4. Mewtwo telekinetically holds the Hammer sideways and rotates it horizontally around itself. As a result, its effective range is severely reduced, as Mewtwo is significantly more vulnerable from attacks that harm it from above than other characters. Wario swings the Hammer above his head while facing the screen, making it seem as if he "wobbles" from side to side. In Smash 4, he faces the screen regardless of which direction he swings, and simply tilts more strongly towards either direction (although the animation of him turning around still occurs before he snaps towards the screen again). This mirrors the "choppy" movements of WarioWare cutscenes. In Melee, Mr. Game & Watch's model can be seen in 3D when turning around with a Hammer. This doesn't happen in Brawl or Smash 4. In Smash 4, if Bayonetta grabs a Hammer (or Golden Hammer) with her forward aerial and stops the attack in midair without performing all three hits, the hammer music will not play. In Brawl and Smash 4, the Hammer's theme was changed to more closely resemble how it sounds in the NES version of Donkey Kong. In Super Smash Bros. 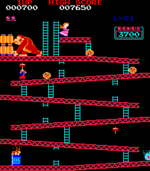 Ultimate, when the Hammer connects a hit, the corresponding visual effect and sound cue from the original arcade version of Donkey Kong are displayed. The item's theme is also changed to that version's theme. The Hammer is one of three items that will change the music being played on the stage temporarily, the other two being the Golden Hammer and the Super Star. Incidentally, all three come from Mario and its sub-universes. This page was last edited on April 17, 2019, at 19:00.